[La Vie:] How does the Fraternity of Saint Pius X prepares itself in view of the theological discussions which should take place with the Vatican? Will it be possible to begin these discussions as soon as Rome establishes the framework? When you speak of settling the arguments, do you foresee the way of compromise, which would allow your positions and Rome's to coexist? While you expect the resolution of conflicts, are you open, as Bishop Fellay [the Superior General] claims to be, to the adoption of an intermediate statute for the Fraternity? Regarding the last answer: "status" or "statute"? I decided to use "statute" because the interviewer seemed to imply a juridical, legal, new reality. Both seem possible, though. I'm afraid that in three years the SSPX will announce victory of the Catholic Faith over Vaticanum II as boldly as they now announce their steadfastness and happily regularize - without any significant change in the attitude of Rome. Let's pray for the change in Rome as bishop de Mallerais sees it. The problem as I see it is lack of canonical status for the FSSPX. As long as they do not have it, they will be marginalized and beating the wind so to speak. Rome can always say: "They have no status" and Catholics everywhere will wonder whether they should associate with them. The other thing is Bishop Fellay is the Superior of the Society and remarks such as this do not IMHO help matters at all. I can just imagine the modernists saying to the Holy Father: "See, we told you they are out for only one thing...to convert us, as if they were the only ones with the Truth". What does not seem possible is Rome recognizing its supposed "errors", which seems to be the only thing Tissier is willing to accept. That arrogant portion of the interview cannot be overlooked. Or else we raise our expectations high without good reason. The belief of the SSPX, that they are in a divine mission to "correct" the "errors" of "Modernist Rome" is an error in itself, a "false doctrine" proper to the SSPX. THEY must abandon that view if the talks are to succeed. SSPX, who is the foundation of unity in the Church? Who is the "teacher of all Christians"? The Successor of Peter, or the Successor of Lefebvre? Rome or Econe? This makes me a little more pessimistic about the doctrinal talks' prospects. "No compromise," "new religion," etc., etc. The bishop seems to see the doctrinal discussions merely as an opportunity to correct Rome. Don't get me wrong, I'd hope these discussions would prompt deeper reflection on the meaning/impact of the Second Vatican Council by those in Rome and throughout the Church. But surely the FSSPX has something to learn or gain from the talks as well? In any event, if all the participants approach the discussion with the bishop's attitude, then I worry about what will actually be accomplished. On the other hand, Bishop Fellay seems less aggressive in his tone when discussing the matter. I hope that there is not endless debate in these talks and that there can be a normalization of the SSPX sooner than later, even if full and complete consensus is not achieved on each and every point - an impossibility. It is now or never under the pontificate of Benedict XVI. He is in good health and determined, thanks be to God, but the man will not live forever. The next Pope, unless the way is paved with several years of Benedict, probably wouldn't be as driven to resolve the SSPX situation. Well, that doesn't some very hopeful now does it? Do you think he's playing bad cop to Bishop Fellay's good cop? I admire the SSPX for standing for the timeless principles and traditions of the Roman Catholic Church. Even more so, I admire their strengh and courage to bring to the Pope and Vatican's attention the very grave errors, abuses which came from Vatican II, and other issues which have caused the Roman Catholic Church so much difficulty over the last 40 years. Bps Tissier and Williamson believe that the Council documents should be scrapped, pure and simple, because they are like a "poisoned cake" (to use Bp Williamson's analogy). Bp Williamson in his interview granted to Stephen Heiner states that Bps Fellay and de Galarreta believe substantially the same. That being the case, what is the point of doctrinal discussions that aim at "clarifications" of Vatican II? Are these discussions really going to go anywhere? Or should we assume that Bps Tissier and Williamson are speaking in hyperbole when they talk of "erasing" the Council? Is the objective of the SSPX in these discussions to clarify or erase the Council? Which is it? From a lay person's perspective, outside the SSPX but who prays and wishes for them to be within the Church ASAP, the interview and standpoints appear hard. Firm but maybe too firm. In this irregular situation that has been created the Holy See has done much to alienate them but certainly there must be some wrong on their part too. Maybe the words chosen in translation just appear rigid. There is an "aire" of arrogance about his statements..We all know the talks are going to be difficult and touch on many gray and painful areas but they should go into these talks with some type of temporary faculties...It would help soften the positions of many as they begin to taste the rewards of regularization. It may open a few hearts and minds...It is going to take a little "bending" on their part too. Pride must be let go a little..Again as a simple lay person we just want you back in..
Will Cardinal Hoyos be involved in the discussions even if he formally resigns his current position? As an observer perhaps? And will the Holy Father be speaking directly or through other people? Don't put emphasis on what is said before the discussions begin. This is a process, and the process will continue to it's end. Instead, pray for unity, and that the right hearts will be converted, the right outcomes be adopted, and that the Church might be strengthened to go forward in the mission of saving souls. He sounds like just another prideful protestant, ready to "reform" Rome of its "errors". This is the sort of fellow who would lecture the Pope on how to be a proper Catholic. What arrogance. It is amazing that this is the sort of man who is held up as one who will renew the Church in the new century. How clearly can he behold the mote that is in the Pope's eye? I believe that the SPPX is 100% correct. The big problem now is that because of the passage of time, fewer and fewer Catholics actually know and understand the objections of the SSPX. The number of Vatican2 bishops are only now beginning to approach 100% of the Catholic hierarchy. The worst is yet to come. The SSPX is beginning to disappear from Catholic consciousness. If this round of talks with Rome keeps the SSPX on the outside, I will never again use the Novus Ordo that I have been forced to use for the last 45 years. Vatican2 is a complete disaster. The Arian heresy is like a church picnic compared to the devastation of Vatican2. Now, after 45 years, the Catholic people no longer know what they are missing. In order to understand the SSPX, you must understand that in its view, the conciliar and post-conciliar magisterium is deficient and adulterated; and there is nothing to be done with it but to abandon it. You don't have to believe this yourself, but you have to understand that the SSPX does. For them to do anything but fight for the return of Rome to the complete and unadulterated Faith would be an act of betrayal of the whole purpose of its existence. So: do any of you have a line of argument to demonstrate that the SSPX is wrong, and making some sort of doctrinal compromise with the Vatican is not the work of Judas? Can you give any reason but the classic American reason: it's "extreme"? If you do, let's hear it. If you don't, why are you not lining up behind the SSPX in defense of the Faith that was given to us once for all? It is, I suppose, logically possible that the Vatican would regularize or semi-regularize the SSPX before settlement of the doctrinal issue. But in real life, the Vatican is not going to give the SSPX the right to compete on anything like equal footing with conciliar doctrine as long as the Vatican believes in conciliar doctrine. The Vatican WANTS the limitations on the Society for just the reasons that Messrs. Perkins, Haley et al. adduce for lifting them. And if by miracle or near-miracle there were a regularization or near-regularization, it would have to be entirely unilateral; Rome will get nothing in return from the Society. P.S. Notice that all four Society bishops will be part of the process. Eviedently the official "distancing" of the Society from Bishop Williamson does not extend to this matter. Give the SSPX's position, this makes perfect sense. Prudence is important, but what above all is important is the Faith. P.P.S. And will those given to it please retire the "arrogance" mantra? If the SSPX is right, then its members are flirting with hellfire if they do anything but fight for the restoration of the Faith. If it is wrong, it is not arrogant, it is wrong, and should be shown the error of its ways. If anyone who is arrogant, it is those who criticize the Society without making any serious effort to take the measure of its teaching. P.P.P.S. And will those given to it please retire the "SSPX about to sell out" mantra unless you can come up with some reason for your position other than the fact that the SSPX is willing to talk with the Vatican? Refusing to talk doesn't even make sense for sedevacantists: by their lights, the Pope should be a logical candidate for fraternal correction and conversion even if he's not the Pope or is just a material Pope or whatever. Let's go over the basics. Doctrinal discussions are set to occur. The SSPX thinks it has the truth. Rome thinks it has the truth. They are getting together to find out which side is right about having the truth, not by compromise, but by argument. This being the Church, the Bride of Christ, I have no doubt that the truth will win out, or more properly, I do not fear the triumph of error. Remember, this is an eccesiastical doctrinal discussion, not collective bargaining by the local teachers union. There can be no compromise about the Faith, and if the truth is to be the outcome, then both sides must come in at least thinking they are right. Can you imagine what the Socratic dialogues would be like if Socrates entered them with a spirit of conciliation and compromise? I notice that critics of Bishop Tissier never factor the struggle for Truth over error into their arguments. Instead they mock the notion that Rome could be in error and that the SSPX may offer a badly needed jeremiad. How soon we have forgotten the Catholic bishops and cardinals who facilitated the molestation of defenseless children. Many of these prelates are still in office. The offense against children is the worst possible and yet you tell me Rome does not need reform, or that it is "Protestant" to demand of the Pope a return to a truly Catholic standard? Deo gratias for such a great Bishop of the Roman Catholic Church! There is no doubt whatsoever that Vatican II and the New Mass form the basis of a new religion - a religion that can only send one, objectively speaking, to the pits of hell! This doesn't look good. This bishop is much too arrogant. All hopes are gone! First of all I don't believe the SSPX will engage in any sort of doctrinal compromise for that is, in itself, a non sequitur, i.e., doctrine is doctrine period. The key is how that doctrine is interpreted and that is where the differences arise. Ever since 1965, indeed even before 1965, the modernists interpreted the doctrine of the Church in the way they wanted which was with a secular flavor if you will and traditionalists interpreted it the way it had been for over 2,000 years. These discussions, it seems to me, must be on correct interpretation of what the Church has always held, taught and professed to be true. And this can only be done when the parties involved have a sincere desire to reach agreement. Lacking that, the discussions are doomed to failure. So, therefore, polemics by either side are not the way forward and the wild card, if you will, is the influence of the Holy Spirit on both sides and the intercession of the Holy Mother of God. If now is not the time, then Almighty God be praised and if it is the time, may He be praised as well. Only He knows whether we have suffered enough with the tragedies that have enveloped our Church in these times. Naturally, I hope He will say enough is enough but who am I to predict such things? Let us all continue to seek the intercession of the Holy Mother of God. As well they should. Catholics believe that Rome can never be in doctrinal error. In how the Roman Church applies and adheres to moral law and ecclesiastical discipline, it can be in error and be in need of reform, but Rome can never lose the faith. The SSPX may not have status but they have the Truth on their side. I, for one, would like to hear how the Vatican reconciles the present day ecumenism with Mortalium Animos. If the Church can sway with the wind, why pay attention to anything It says today for tomorrow conditions may change. Like with Rossmini (am not sure of spelling) or, for that matter, John Calvin and J. Rousseau. Condemned yesterday; hailed (and beatified) today. Finally, the condition of the Church in the year of Our Lord 2009 gives me absolutely no confidence in the fact that the Church's keener insight into doctrine is, in fact, keen at all. Respectfully submitted to Prof Basto and one other who have laid a charge of "arrogance" against the bishop. In these statements one must observe words and phrases used very carefully. The bishop states "unless Rome reforms its viewpoint". Clearly he is not insinuating that the Holy Father has defected from the Faith. The viewpoint in "Rome" could point towards many others, but in a nutshell clearly seems to refer to the postconciliar attitudes towards ecumenism, religious freedom and collegiality. These are specifically what he singles out as the predominant viewpoints from the powers that be in Rome that he claims will need reform. And frankly on those 3 counts no one can reasonably argue that the attitudes from Rome on these 3 topics marked a clear break from the Tradition practiced prior to 1965. So I don't believe the Bp is being arrogant in stating the Society's position. And in hitting those 3 key areas, Vatican 2, as a council pre-ordained by Pope Paul VI up front as a non-dogmatic, and therefore, a prudential or pastoral council, whose prudential (read non-dogmatic) assertions are not protected from error, according to Sacred Tradition - on these 3 key areas Vatican 2 will stand or fall. As a prudential council there would be nothing inconceivable if it were to eventually be shelved or dustbinned. This has happened to other non-infallible councils even ecumenical ones. I am troubled by the Bp's description of the New ordo of the Mass as a "new theology and therefore a new religion". Those are very strong words in deed and one can only hope that the "sspx negotiators" use objective Thomistic arguments to make the point they are trying to make. And also that appropriate language will be used because if truly they insist that the New Mass respresents a "new" religion, I doubt that any reconciliation can take place given the severe implications of such a statement. May Our Lady on Her First Saturday guide the faithful on both sides of these discussions in true Wisdom to the truth in charity. Our Lady of Fatima ora pro nobis. Hmmm... so Rome has defected from the Faith. I had no idea. How terribly disappointing. I wonder then to which sect should we go then, in your opinion, the Orthodox, the Old Catholics, some Protestant sect? One thing is for certain, there is no such thing as the Catholic Faith left, right? I admire bishop de Mallerais for his preference of Catholic Faith over comfortable position in the Church. In the long run it can only have good outcome. People who do not see difference between Protestant arrogance and the legitimate demand to restore the Truth to its due place fail to distinguish truth from error and are coming close to an insult to the Church. All Popes up to John XXIII were "Lefebrists" and upheld "lefebrite" teachings. Comparing them to Protestants and plain lies invented by Luther is just nonsense. John McFarland: P.P.S. And will those given to it please retire the "arrogance" mantra? If the SSPX is right, then its members are flirting with hellfire if they do anything but fight for the restoration of the Faith. If it is wrong, it is not arrogant, it is wrong, and should be shown the error of its ways. If anyone who is arrogant, it is those who criticize the Society without making any serious effort to take the measure of its teaching. It's not a matter "arrogance" nor "obedience". Truth has its rights. Hiding the Truth for the sake of not offending anybody (like the Vatican does nowadays) is wrong. That's why most of us are here, I suppose (well, there are some who are just "attached to the Traditional Latin Mass", but why should they care about the SSPX?). Jordanes: Rome can never lose the faith. What a stinking mess we have! Recapping, Rome is in error; Rome can't error in doctrine just application; V2 has no real doctrine, it is pastoral; don't presume to teach the Pope; Rome burns while Nero fiddles; vote buggery for Bishop; V2 is the the Holy Spirit's wishes for the Church! I pray for the end of this confusion post haste. Lets put it all on the table and let God decide. I am reminded of the psalm where it is said that this generation is stubborn and do not know God's ways. We have V2 for one generation now - let it end. Souls are being lost. Where is our strong leadership, justice? It is my speculation that Fr. Dominique Bourmaud who authored “A History of Modernism: From Aristotle to Vatican II” might sit on this commission. In his work, Fr Bourmaud demonstrates his scholarly erudition and grasp of the historical developments preceding the Council. I quote a few words from his introduction: “…. why pore over dusty old documents to revive a dead issue of scant interest even to the most ardent amateur of Church history? If my speculation proves to be correct, a most competent & erudite theologian & historian sits on the commission. “A History of Modernism” can be obtained from The Angelus Press. is it permissable for me to validly confess my sins to a priest with faculties, and then later go to confession to an FSSPX priest to get the excellent spiritual advice they give to battle my besetting sins? I hope, so because I very rarely get any advice at all from diocesan priests in confession, but the FSSPX priest I used to go to gave me awesome advice that helped me reduce my occasions of sin. I expect the overwhelming majority of Popes would be in complete agreement with Bishop Bernard Tissier de Mallerais. On canonical status, once again, we need to consider some distinctions. Bishop Tissier de Mallerais is referring to a final and permanent status in his last paragraph. He is also saying, on the entire matter of status, that there is no 'urgency'. First, this does not preclude the possibility of the Society accepting a temporary and provisional status, which Bishop Fellay says that he is now willing to "consider ... definitely" if it will afford adequate safeguards for the Society. Secondly, nothing T. de M. says precludes the Society 'acknowledging' a status or condition for itself which is merely recognised by Rome. Bishop Fellay also commented on this possibility on 15th June (Zenit), saying that the Society is not opposed to Rome recognising the Society, if that is what Rome wants to do. So let us not be misled by anything here. We need to wait for the motu proprio, if it EVER comes. Where the hell is it? The Cardinal gives a farewell interview and yet is still chained to his desk the next day. Will the m.p. come on Monday? I ask because the Pope will presumably not want this affair to overshadow his economics encyclical, which is coming on Tuesday; nor will he want it to overshadow the visit of Barry Soetero to the Vatican on the 12th. So it's either Monday or after the 12th? The Pope leaves Rome for the holidays on the 13th. Professor Basto makes an excellent point, I think. Quite apart from his remarks on doctrinal authority, I do agree entirely that this is a huge stumbling block. Frankly, I can't imagine any doctrinal unity under current conditions. Prof. Basto refers to the prideful Tissier. For the sake of argument alone, I will admit this here. However, there is also the matter of the prideful liberal prelates. Will Rome be willing to declare anathema positions which have been articulated clearly by countless liberal bishops? You'd need a Pope St. Gregory the Great to manage that! Since the answer to this question is negative, the only way to repudiate popular liberal interpretations of Vatican II will be to wait for the liberal prelates to die off. Yes, yes, I know, liberals are being replenished every year. But the hard bit is to get past those who have staked out positions in the 1960s and 1970s, mainly. That is because prelates who implemented the reforms in those decades did so on the ground of false doctrine. They built their 'careers' on it. Tissier was right in the past when he predicted that such a process would take *at least* thirty years. "But surely the FSSPX has something to learn or gain from the talks as well?" Ah, but there's the rub. Does it? I'm not so sure! What if it turns out that the S.S.P.X has absolutely nothing to learn from the new ideas of Vatican II? What then? The interviewer in this article actually showed some intelligence, which really shocked me. I've always taken the view that journalists were all retarded by definition. But he predicted a likely situation when he asked if the Society would be willing to accept the co-existence of two views on some issues. This is the route taken in the matter of Fr. Leonard Feeney in the last century. Essentially, Rome says that every position taken by the Society on every issue is entirely acceptable--even to the point of allowing the Society to condemn all other views. However, the Pope will not invoke his Magisterium to condemn all the errors claimed by the Society. In other words, Rome would not forbid faithful from choosing between two views on some things. Tissier would find this outcome to be unacceptable. What he wants is simple: 100% capitulation from Rome so that, whatever the Society anathematises, Rome uses her Magisteriusm to anathematise as well. Until Rome agrees to do this, he will oppose any permanent canonical re-integration of the Society. Given this attitude, I can't see any possibility of rapprochement until you change the players. You don't need a new chessboard. You need new chess players. This means ditching the liberal prelates or else ditching the Society leaders, or both. "Will Cardinal Hoyos be involved in the discussions even if he formally resigns his current position?" That is a very insightful question. There is no reason why he could not continue to be involved in getting the Society at least a temporary structure after he resigns. There is no rule forbidding it! "Catholics believe that Rome can never be in doctrinal error." True enough, provided you specify what you mean by 'Rome' here. Even popes can adopt doctrinal error. What they cannot do is stubbornly and resolutely to deny a dogma which one must believe by divine and Catholic faith. Not all doctrines fall into that category. "How clearly can he behold the mote that is in the Pope's eye?" Not really an appropriate reference here, Adeodatus. The Bishop is not faulting the Pope on a matter of sin. This ia all about faults of a different order: failures in understanding in regard to the Faith. "The Vatican WANTS the limitations on the Society for just the reasons that Messrs. Perkins, Haley et al. adduce for lifting them." If you change the first two words in this to 'The liberals who still hold sway in the Vatican', I'd agree entirely with the whole posting. The Pope, despite his possible doctrinal faults on some things, does want a free-ranging Society, I think. He wants it because it would put pressure on the local bishops to stop obstructing "Summorum Pontificum". Again, the Society's impact is not enormous anyway and a number of bishops are defying the Pope on the 2007 m.p. (I mean you, Bishop Ramirez of Las Cruces; I mean you, Abp. Jordan of Reims). Most obstructing bishops will stop their obstruction in order to keep the S.S.P.X at bay. They don't want to have to deal with a Society which they can't conrol. Again, the prime motive of the bishops is and always has been a desire not to lose face. That's why they worry so much every day about what brainless journalists write in the popular press. He can sign it from Castel Gandolfo. "All Popes up to John XXIII were "Lefebrists" and upheld "lefebrite" teachings. Comparing them to Protestants and plain lies invented by Luther is just nonsense." In 1891, the Lefebvrist Pope Leo XIII penned 'Rerum Novarum'. In it, he affirmed ..."
Exactly. It is not to say that Rome has lost the Faith and is heretical but in its non-infallible engagement of these novelties is the problem. Even in liturgical matters (also not infallible) we have an inferior liturgy with includes an inferior but valid ordination prayers, baptism, “anointing of the sick,” etc. etc. and of course the new Mass itself. Again, all valid but inferior. I am glad they are starting on liturgical matters though because that affects the faith the most. If the intention is to dismiss comparisons with Protestants, it probably isn't a good idea to anachronistically claim Catholics who lived and died before the time of Msgr. Lefebvre as Lefebvrists, for Protestants have also often anachronistically claimed pre-Lutheran Christians they happen to like as Protestant or proto-Protestant. The Holy Father has taught grave errors both before and after ascending to the pontificate. His firm adherence to the teachings of Vatican II demonstrate this well. Case in point, his recent ecumenical prayer gathering in the Holy Land was a mortal sin against the First Commandment. PKTP said, "From now on, let us refer to preconciliar popes as 'Lefebvrists'. This might be example:"
The liberals now say such and such is a Councel of Trent priest, yada yada...of course in a unchanging, unenlightened sense. "As well they should. Catholics believe that Rome can never be in doctrinal error." YOu misrepresent the catholic faith. The church can never teach error to be believed on pain of damnation, but "Rome" can err - otherwise, why, at Vatican I was there debate about how the pope could be infallible when so many popes had been "heretics" (about 39)? If this the attitude of the SSPX, there won't be reconciled to the Catholic Church. They will continue to fall towards and finally completely into schism. Hopefully they have a change of perspective. Hmmm. Thought they were valid? And if they are valid, who should care if they are deficient? Just proves the SSPX doesn't even believe its own propaganda which attempts to foist doubtful priests and bishops upon the faithful. Zig when they say "zig," and zag when they say 'zag!" Dan Hunter: What is preventing you from making an appointment with an SSPX priest for spiritual direction? Jordanes: "Rome can never lose the faith." Our Lady of La Salette: "Rome will lose the Faith and become the seat of the Antichrist." Just as when Arians held the hierarchy and the buildings, but lost the Faith, Modernist Rome can hold the hierarchy and the buildings, while losing the Faith. For those not invincibly enthralled by the denial of the Great Apostasy, I suggest Cardinal Manning's "The Pope and the Antichrist"
The Bishop is correct. Rome must repent of Her errors which have destroyed the Church and return whole and entire to the Catholic Faith. The sooner the better. They have all lost their minds and their tripe is being defended by the Emperor has no clothes Catholics who think the Pope can do no wrong. Wake up! You haven't a scintilla of evidence that the Pope is a Perkinsian; you just want to believe it. Perhaps you're right, but it's not because you have any reason to be. As for this face saving business, let me point out that the Society knows infinitely more about the disabilities under which they labor than you do. If they thought a status deal could be worked out without adversely affecting weightier matters, they'd do it -- indeed, jump at it. That they do not srongly suggests that you're building canonical castles in Spain, and that it's you who have the face saving problem. "if they are valid, who should care if they are deficient?" You don't care if the new rite of priestly ordinations is deficient? Anonymous 22:53 wrote this, "Hmmm. Thought they were valid? And if they are valid, who should care if they are deficient? " Yes valid and deficient - we should all care. Where have you been, the priests and bishops of the FSSPX are not doubtful in the eyes of the Church. I don't get what you mean that the FSSPX are not believing their own propaganda from the statement you quoted? Perhaps I am not understanding your comments correctly? To me this shows all the more reason to get Church leadership to say something definitive and to deal with the doctrinal discussions promptly. You claim that the New Mass is a new religion and that it "can only send one to the pits of hell." Our Lord becomes truly present in the Most Holy Sacrament of the Altar. His presence is true whether the Mass is said in a language you like, or one you don't. His presence is true whether they sing songs by Bernard of Clairvaux or Marty Haugen. When you claim that the Novus Ordo Mass sends people to the pits of hell, you are not only espousing the heresy of denying the True Presence, you are blaspheming Our Lord Who graciously becomes present in the Sacrament, and you are blaspheming the Holy Spirit Who acts truly and presently in the Mass as well. "Brother" Anthony, you are not only a heretic but a blasphemer. If you do not repent of your wicked locutions you are likely to find yourself burning in those pits of hell you mentioned. I say this both for your own good, and so that you will stop polluting the souls of others with your blasphemy. The special charisma of some members of the dear fraternity seems to be to render the truth odious to others. When I hear Bishop Fellay, I cringe .... when I hear Bishops Tissier and Williamson, I rejoice! The Society has exceedingly valid points and I'm very glad that Rome is finally willing to confront these very problematic documents which have been promulgated in the name of the Church. And one has but to attend any weekly Sunday Mass anywhere to only see the current state of the Church as a belief system. It is clear that this state of belief can be linked to a Vatican II mindset and Rome needs to clarify the very ambiguous documents. The Society is right for its position--or should we look to Georgetown or Notre Dame for guidance? Oh my goodness... people now judge the Pope soul! Snow, prophecies of private revelations can never be placed in opposition to the Catholic faith. As for the LaSalette apparitions, my understanding is that the seeress herself admitted to getting some things wrong. Anyway, the prediction is that "Rome" would lose the faith, not that the Roman Church would lose the faith. Perhaps the prediction refers to the city rather than the Holy See. Or perhaps the prediction is simply false. In any case, no one is under any obligation to believe in that prediction. The Roman Church, that is, the See of St. Peter, has never defected from the faith and never will. I would like to point out, of course, that the Holy Father committed a grave sin objectively. Whether he was actually culpable is between him and God. 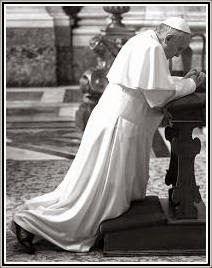 Let us pray daily for the Holy Father that he may continue on the path to restoring the Church to Tradition, especially by consecrating Russia to the Immaculate Heart of Mary and that he may be protected from his enemies. Our Lord becomes present and is offered up to God at a schismatic Orthodox Mass as well. And of course, the Father accepts His Son's sacrifice. Nonetheless, the Orthodox priest and those that assist commit a grave sin against the First Commandment, objectively speaking. This is a parallel to what happens at a valid Novus Ordo Mass. Validity is necessary, but not sufficient for a Mass to be pleasing to God as offered up by us frail men. ie. "The belief of the SSPX, that they are in a divine mission to "correct" the "errors" of "Modernist Rome" is an error in itself, a "false doctrine"...". Well, it may be a wrong opinion of the SSPXers/Bf. Tissier, but it is of course no "false doctrine" to state Rome is in error. all catholic teachers and theologians hold that Rome can fall into doctrinal error. - Rome in the sence of the people/Cardinals (etc.) around the Pope as well as the Pope himselfe. He only cannot fall into error when he speaks ex cathedra. Otherwise he can. (And some Popes did - but only few, not the huge number one poster suggested ;-) ). One loses the theological virtue of Faith when one sins against dogmatic teachings of the Church regarding Faith (body of inerrant doctrine in principle) and Morals (body of inerrant doctrine put into practice). Were not Assisi I and II grave sins against the First Commandment? Did not Pope John Paul II preside over both? These were grave public scandals against the theological virtue of Faith. Therefore, objectively speaking, we can say that Pope John Paul II defected from the Faith. What we cannot say is that Pope John Paul II dogmatized error. This is the true sense of papal infallibility. LaSalette is an approved apparition of the Church, meaning that there is NOTHING in it against the Faith. Jordanes' "understanding" that there MIGHT have been error, does not trump an official finding that NOTHING transgresses the Faith. And is goes much furhter than even PKTP said ("Even popes can adopt doctrinal error. What they cannot do is stubbornly and resolutely to deny a dogma which one must believe by divine and Catholic faith."). No, a Pope can also "stubbornly and resolutly deny a dogma"
He only cannot teach this his opinion ex cathedra. "ut Domnum Apostolicum ... in sancta religione conservare digneris" ?! If by "Rome" one means "the Holy See," then yes, it is a doctrinal error to claim that Rome is in doctrinal error. The Holy See cannot defect from the faith, but has always preserved the tradition handed down from the Apostles. That's just wrong. All Catholic teachers and theologians hold that the Roman Church cannot defect from the faith. It's never happened before, so what changed that allegedly made it possible now? Possibly. But that sin, if it is one, does not mean the Holy See has lost the true faith. No, there's more to the Holy Spirit's strengthening of St. Peter's faith than merely not defining errors as dogma. Or at least there is nothing in those LaSalette revelations that the Church has approved that is against the faith -- but there's no evidence that the above prediction was ever approved by the Church. On the contrary, when that prediction was published, it generated great controversy and caused the LaSalette apparition and devotion to lose popularity. The Holy See cannot defect from the faith, but has always preserved the tradition handed down from the Apostles. You are deceived concerning the true nature of this crisis. The Holy See has taught (among other wretched things since Vatican II) that Muslims worship the same God as Catholics. That is a profound theological error. Thus the Holy See is obviously not preserving the tradition handed down from the Apostles. I do not say that the Holy See is vacant, I say (with Bishop Tissier) that the Holy See needs to return to its Catholic senses. "I believe that the SPPX is 100% correct. Too much time has passed". There is around billion Catholics around the world and ignoring their knowledge or rather lack of knowledge about SSPX is arrogance in itself. Mostly, they consider SSPX troublemakers and do not understand what it is all about. The fact that any doctrinal talks take place is certainly pointing that the Holy Father and those who are close to him and helping him are well aware of the situation in the Church and needs to return to traditional doctrines. Doctrinal talks with SSPX offers more than excellent opportunity to do so. It may all start with the reform of the reform, but I suppose it will evolve sooner or later into return to proper Catholicism. At least something unprecedented has started. We need to be optimistic. So many unhelpfull and confusing comments. Well, of course you can critisize Bf. Tissier. - And I also do it (at least IMHO the interview is imprudent now). But to suggest that noone can ever correct Rome is not at all in the right ballpark - and shows a lack of historical knowledge, because what´s about Paul correcting Peter or St. Catherine the Pope - - or the vision that St. Francis had that he is to stake, to shore up the Church? So it is childish and unscholarly to call Bf. Tiessier "arrogant". Well, you might hold the opinion and argue for it, that the SSPX is no new St. Francis to uphold the Church - but you cannot exclude this possibility a priory, calling such an attempt arrogant or protestant! - but, as Mr. Mc Farland puts it very well, it is an unhelpful, not worth to be taken seriously in a serious debate "mantra" to call the SSPX "arrogant". Seems to indicate a lack of good argument on the own side. No, you are confusing validity and dignity/quality. Well, you are free to argue against Br. Anthony - but you can only do so with other arguments, not based on validity-question, otherwise you miss his point. Frank (re LaSallet): totaly right! Pope Liberius, Pope Honorius and Pope John XXII felt into error - or at least had a tendency towords it. (And the thelogians and chuch-historians had no problem in principal with the idea that they really felt into heresy, notwithstanding if they in fact did or not). The Pope, if he doesn´t speak ex cathedra, can fall into error/heresy. Can you quote any well-known thelogian that holds the opposite?? It's common sense that the Pope would want to use the S.S.P.X to help encourage his bishops to implement S.P. Popes don't like being defied by their own bishops. That's just common sense. In this case, Society pressure on the bishops is not a great risk to Rome because the Society has a very limited reach to begin with. The numbers tell us that and they are evidence. You think that I want to 'save face'? You couldn't be more wrong there. I couldn't care less and never have. What I want and have always wanted is to end the power of local bishops to obstruct the ancient Mass. To me, the ancient Mass is the most valuable thing we have: more valuable than the earth we stand on. It is fundamentally unjust that local bishops should have the power to obstruct its celebration. It is not theirs to obstruct. That has been my main motive from the beginning. My problem is not your problem because we have differing views on the legitimacy of the Society position. To Society supporters, there really is not much of a problem here: they already have an unobstructed power to provide Masses since they opearte under a claim of supplied jurisdiction. But for those of us who deny this, the bishops still have a power to obstruct, and a large number of them are using it. It is certainly true that a recognition by Rome of Society Sacraments would not, in itself, hurt the Society and would likely increase the number of people repairing to Society chapels. I stand by what I've said about bishops losihg face. These assessments are grounded in judgement. Evidence? You can have evidence of almost anything but then comes its intepretation. That requires judgement. I don't insist that others on this blog agree with mine. I present it for their consideration and then leave it at that. I don't care if you don't agree: that's your business. "You haven't a scintilla of evidence that the Pope is a Perkinsian; you just want to believe it. Perhaps you're right, but it's not because you have any reason to be." That is illogical. Reasons for believing a position can be based on a judgement of all the evidence known to the believer. It is a matter of interpreting this 'evidence', which, in this case, consists of the Pope's behaviour and his statements and also logical predictions of what he might want, given those statements and positions. So there is lots of evidence available in regard to him and McFarland has no way of knowing how much of it I am taking into account. Of course, he can arrive at a different interpretation. But he cannot know that I draw a conclusion from not "one scintilla of evidence". I have access to a great deal of evidence of his beliefs and motives. It is available for anyone to consider. Adeodatus: "Our Lord becomes truly present in the Most Holy Sacrament of the Altar. " "For this is my blood of the new testament, which shall be shed for MANY [NOT "all"] unto remission of sins." Jordanes: "Anyway, the prediction is that "Rome" would lose the faith, not that the Roman Church would lose the faith." In which case you might avoid teaching such expansive errors as your "Rome can never lose the faith." I counsel the Catholic virtue of humility. "What we cannot say is that Pope John Paul II dogmatized error. This is the true sense of papal infallibility." "No, there's more to the Holy Spirit's strengthening of St. Peter's faith than merely not defining errors as dogma." Neither does it mean that every scrap of paper or hot air that blows from the Curia —or even from the Chair of Peter— demands submission. The Holy Father is BOUND to Tradition. He cannot use the Keys to bind us to novelties or other errors. The Vatican Council infallibly defined so. First of all, your questioning of whether Assisi I and II were sins against the Faith is absurd. It shows you have a poor understanding of sins against the Faith. Secondly, I clearly demonstrated how the pope (in this case, Pope John Paul II) can lose the Faith by sinning (objectively) against the virtue of Faith and yet you still doubt it. The direct object of the theological virtue of Faith is the Church's body of doctrine (in principle or practice). If one gravely offends against this body of doctrine, whether by thought, word, deed, or omission, then he commits a grave sin against the theological virtue of Faith. One who commits this grave sin agsinst the theological virtue of Faith has, objectively speaking, lost the Faith. Thirdly, the dogma of papal infallibility is principally concerned with the Holy Ghost preventing the pope from teaching errors in a solemn pronouncement on Faith and Morals. It is a negative help. "If by "Rome" one means "the Holy See," then yes, it is a doctrinal error to claim that Rome is in doctrinal error. The Holy See cannot defect from the faith, but has always preserved the tradition handed down from the Apostles." I suggest that there is a world of difference, Jordanes, between being in doctrinal error and defecting from the faith. 'Doctrine' just means teaching. Not all doctrines are de fide dogmas. I'd like to thank Picard for correcting me. It is indeed true that a Pope can even adhere to a formal heresy but he cannot teach it ex cathedra. At any rate, the point is that there can be a great deal of error even at the highest levels. Again, on McFarland's odd statement about not havinng any 'evidence' by which to judge the Pope's intentions or wishes, I point out that the Pope is a very public man. As a result, his behaviour and statements and actions are a matter of public record. It is, rather, Jordanes, who has not one scintilla of evidence about how much of that data Perkins in considering in reaching his opinion about the Pope's point of view--other than what Perkins may have revealed in that matter here on this blog. - the SSPX hold to the original purity of the faith whereas most of the church is following a "new religion". - Rome has fallen into error whereas the SSPX keeps the truth faith. In other words, just what the Protestant Reformers claimed (substitute 'Protestants' for the word 'SSPX' in the above statements). I think I'll stick with Rome. I pray that God will give these people the necessary humility for reunion to be possible. On the contrary, when that prediction was published, it generated great controversy and caused the LaSalette apparition and devotion to lose popularity. Not only that, but the book containing that quote ("Rome will lose the Faith and become the seat of the Antichrist") was placed on the Index. Yes, the apparition at LaSalette is approved but it does not follow that everything that purports to be from that apparition is approved. Rubbish. The Orthodox Mass is schismatic because it isn't offered in union with the Pope. The secular expression, in need of a "attitude adjustment" has a spiritual and catholic counterpart -- change of heart. Applied to present cases, and whatever the deficiencies are of "Rome", in order of charity and in order of superior to inferior, the SSPX needs an attitude adjustment in the order of humility, to look no further than we all must, to Holy Scripture -- remove first the beam, SSPX, in your own eye so that you may be truly helpful to others. You are a heretic if you believe Rome "destroyed" the Church. Destroyed, destroyed. That is impossible. Are you out of your freaking mind? Get over your hatred of the Catholic Church, ignore the BS of the SSPX and the SSPV and all of those other screwed up groups.. The Bishop is correct. Rome must repent of Her errors which have destroyed the Church and return whole and entire to the Catholic Faith. The sooner the better. They have all lost their minds and their tripe is being defended by the Emperor has no clothes Catholics who think the Pope can do no wrong. Wake up!" Indeed you did misunderstand my post. I wasn't referring to the SSPX's orders, but rather to Bp. Tissier's comment that the Novus Ordo priestly ordinations are deficient. I do in fact agree with Bp. Tissier that they are deficient but question how they could in fact be deficient and yet remain valid (according to the SSPX). 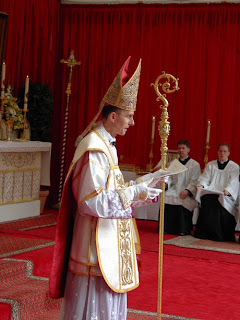 Also, I wonder why the SSPX uses Novus Ordo priests without conditional ordination if they think that the orders are deficient. They can't have it both ways. In my book deficient = invalid. The Church can't confect deficient sacraments as she is protected by the Holy Ghost. Therefore, one rightly concludes that the new holy orders do not proceed from the Church. Personally, I think that holy orders received in the Novus Ordo is, at the very least, doubtful. I come to this conclusion based on the facts I have at hand. I will stay away from Novus Ordo ordained clergy until the modernists are driven from the bosom of the Church and competent authority settles the issue. SSPX outside the Catholic Church is just another Protestant sect which is quickly losing it's importance to mainstream Catholics. Inside the Church, SSPX would grow like crazy and would become very powerful in reforming the Church. At the end of the day it's all in the Holy Father's hands and I believe he'll have SSPX back in by next year. Regardless of the sharp elbows, it's just a matter of dotting the I's and crossing the T's. On my last submission, I obviously meant that it is McFarland, not "Jordanes" who has not one scintilla of evidence. "Our Lord becomes present and is offered up to God at a schismatic Orthodox Mass as well. And of course, the Father accepts His Son's sacrifice. Nonetheless, the Orthodox priest and those that assist commit a grave sin against the First Commandment, objectively speaking." It is a contradiction in terms to say that one can commit a "grave sin ... objectively speaking". Sin by definition must have an objective AND a subjective component. What is meant is that Eastern Orthodox worship is disordered insofar as it is offered apart from legitimate authority. We can't know if any sin is involved. Only those who believe that the Orthodox Church is wrong and go anyway commit a sin. Snow, your position is incorrect. It is true that 'for all' is a mistranslation of pro multis. Pro multis can mean more than 'many'; it can mean 'the many' or 'the multitude'. But the Latin does not signify everyone. You're right there. However, this does not prevent a valid consecration. The reason is that the 'for all' wording is open to an orthodox interpretation. And, as John Paul II once said, the orthdox interpretation is the correct one even when the more obvious meaning is heterodox. In one sense, Christ did die for all. He did so in the sense that He wishes that all may be saved, in the sense that all will co-operate in God's grace efficatiously unto salvation. In another sense, Christ did not die for all but only for those who would so co-operate. Because the Consecration most naturally refers to the FRUITS of salvation, the heterodox meaning is the most obvious one from the mistranslation. That is why the mistranslation is such a scandal. That is why it absolutely MUST be corrected. The mistranslation is leading souls astray and leading some into a belief in universal salvation, which is not a teaching of the Church. However, the correct meaning of 'for all' here is the less obvious meaning. It must be so, for the orthodox meaning is the one intended by the Holy Ghost when He speaks through Holy Church. The sspx would not grow like crazy if recognised by the Church. Thats nonsense. they only attract people who share all their views. If the pope recognises them vocations are not going to come flocking out of the mountains to their seminaries. There are many groups in the church today fighting for the return of tradition, not to mention the positive effects of the motu proprio. We've already been over this. It's not a profound theological error. It's not even an error at all. Then you believe that the Catholic Church has lost the Catholic faith. Either give up your heretical belief that the Holy See is not preserving the Apostolic Tradition, or else be consistent and join some other religion. I think you need to return to your Catholic senses, Prodinoscopus. The errors of Liberius and Honorius were not that they taught false doctrine, but that Liberius, under great duress, signed an ambiguous formula while indicating that the formula is to be understood in an orthodox sense, and that Honorius, while not a Monothelete himself, did not condemn Monotheletism when he should have. In neither of their cases can in be said that they fell into doctrinal error. John XXII did attempt to propound a doctrinal error, though shortly before his death he withdrew his erroneous opinion on the Beatific Vision and said he never had any intention of putting his opinion forward as authoritative. Sure. It's just that that doesn't establish that Rome has ever defected from the faith or formally taught any doctrinal error. The only possible cases of that are the three you mentioned, and those cases don't stand up to scrutiny. How, then, has it come to pass that in the 20th century, the Holy See has formally propounded doctrinal error? But not in the sense I gave. Yes, even then. The scandalous mistranslation of "pro multis" does not affect validity at all, but if for no other reason than it has scandalised the faithful, misleading many of them into the false belief that it invalidates the sacrament, it ought never to have been approved in the first place, and frankly ought to be rescinded immediately, not just when the new translations are finished and approved in whatever year the episcopal conference and Vatican bureaucracies finally get that job done. It's not an error, Snow. The LaSalette prediction alleged to come from Our Lady is, however, apt to interpretation in a doctrinally erroneous sense -- the sense in which you apparently interpret it. Thanks, and I counsel the same, and that you stay away from unapproved or condemned private revelations. Unless they are true novelties, ones that do not contradict Tradition or that further develop and unfold a doctrine. Whatever. You haven't established that the Assisi meetings (which I think have generated far more scandal than good fruit) were sins against the First Commandment on the part of the John Paul II, though I have agreed they could be. Nor have you established that if John Paul II's Assisi gathering were sins against the First Commandment, that means the Holy See has formally defected from the Catholic faith and no longer maintains the truth taught us by the Apostles. Doubt what? Even if a pope individually loses the faith, that doesn't mean Rome has defected. Yes, and formulated positively, that dogma means that when a pope teaches ex cathedra, he'll not only not be teaching error, but he'll be teaching the truth, infallibly so. Well, I suppose in your sense, one might say that the Holy See has perhaps almost always been in doctrinal error. It would be scandalous to say such a thing, though. It's better simply to affirm that the Holy See is incapable of defecting from the faith and formally propounding erroneous doctrine. I'm sorry, Mr. Perkins, but I don't know why you're bringing me into this. I haven't been following your latest interaction with Mr. McFarland. Did you mean to say "Mr. McFarland"? Thanks for clearing that up, Mr. Perkins. You had me scratching my head there -- I couldn't figure out what I'd said that you were referring to. But no offense meant, and none taken. PKTP: "However, this [changing Jesus' words for the formula of consecration] does not prevent a valid consecration. " "If the priest were to shorten or change the form of the consecration of the Body and the Blood, so that in the change of wording the words did not mean the same thing, he would not be achieving a valid Sacrament." The wording was changed, and a "similar" meaning "if you give it the orthodox interpretation, even if it is not the most obvious interpretation" is NOT "the same." A LIE does not confect the sacrament. "the sense in which you apparently interpret it." Jordanes, you said verbatim, "Rome can never lose the Faith." The Blessed Mother flat out contradicted your expansive error, having said that "Rome WILL lose the Faith." You made a sweeping generalization that the history of the Arian heresy AND the Blessed Mother showed was an error UNTIL you qualified it. It is precisely the issues of greatest contention that will determine whether or not He finds Faith when He returns. BECAUSE OF THAT I respectfully suggest that this blog focus entirely on discussions of WHAT is right, not WHO is right. One of the reasons I rarely contribute here is the enormous ego involvement of some who seem constitutionally unable to say "I made a mistake" or who compulsively must have the "last word," even to disabling comments when clearly much remains to be said. With due respect for all the moderators DO know, the moderators do not know everything and do not have the charism of infallibility. I reiterate. I counsel humility. What do we have to lose but the vice of pride? De Defectibus is disciplinary, not doctrinal. "It's better simply to affirm that the Holy See is incapable of defecting from the faith and formally propounding erroneous doctrine." Well, the Holy See is not a person who can have faith. I think that we were discussing the Pope. The Church cannot defect from the faith, of course: that would be a tautology. The Pope could do so but would cease to be Pope at that very instant. I was just tying to make some distinctions there. Not all doctrines are de fide dogmas, that's all. "The Blessed Mother flat out contradicted your expansive error, having said that "Rome WILL lose the Faith." Snow, by "Rome", the Blessed Mother did not mean the Church. The Church has the faith by definition. Rome here presumably means the City in general and, likely, most of those in the hierarchy. I don't see how we can know the state of soul of Pope John Paul II in order to judge that he has sinned gravely against the First Commandment. In order to lose the faith, one must be informed that one has departed from the truth and, knowing this, one must refuse to reform one's heretical views. I agree with you, Brother, that Assisi of 1986 was a grave scandal which needs to be condemned formally. Let us pray that the S.S.P.X will challenge Rome on this. However, we can't know that John Paul II defected from the Faith, and he did not lose office for doing so because he did not refuse to desist from heresy after having learned of it and having been warned against it. I suspect that many in the Church now hold heretical views materially, thanks to the entire revolution which informed Vatican II and came from down under (and I don't mean Australia). We have entered a terrible period, worse than the Arian period, in which material heresy has become the norm. Never could it have been imagined that the invincible ignorance which protects Protestants would one day protect so many of us. For example, in one U.S. poll of 'Catholics', only 18% believed in transubstantiation, but I note that many of the respondents were not even *aware* of the Catholic teaching. ""If the priest were to shorten or change the form of the consecration of the Body and the Blood, so that in the change of wording the words did not mean the same thing, he would not be achieving a valid Sacrament." But the change to 'for all' does not alter the meaning one iota as long as, by this, it is understood that 'for all' refers to those whom Christ hopes will co-operate in God's grace. As long as the new formula is open to the same meaning, there is no change in meaning. However, there is added an ambiguity and this does result in a defect. So you have a defective but still valid formula. I agree that it is urgent to correct the mistranslation but the mistranslation does not, in itself, intend a change in meaning, even if those who devised it meant to do so. The forms, to follow tradition in English linguistics, would be Perkinsian, Jordanesian, and, yes, McFarlander. I note that, in the context of the Church (but not in other respects), such terms are coined to indicate heresies. That's why it's profoundly insulting to use the terms Lefebvrist and Lefebvrite. It suggests the name of a newfound heresy, whereas adherents of the Society merely hood and profess what Catholics have always held and professed, and do not deny any de fide teaching. There is no evidence that Our Lady ever said Rome will lose the faith. Catholics should shun unapproved private revelations that purport to prophesy the apostasy of the Roman Church (if that's what that purported prophecy means). Please don't quote that alleged LaSalette prophecy at me any more. It proves nothing. on the other hand he is obviously not willing to engage in a real discussion and, much worse, twists my and other´s words (and so argues about/with a straw man or a red herring), not willing to argue to the point. with "Rome" we mean - of course - either the people and dicasteries around the Pope, that are not infallible ("the Vatican", as some like to say) or the Pope himselfe, but not speaking ex cathedra. So Rome in that sense can err - and lose the faith. but after I have read several posts of Jordanes now and also considering this new debate, I am sorry to state that there realy seems to be a lack of good will on Jordanes side. Sorry for saying this so frankly and freely , but going on this way there can not be a fruitfull discussion. - Well, the other posters should judge on their own if I am wrong on that or not. re the historical examples of PP Liberius, Honorius, John, I made it clear, that irrespective [I said "notwithstanding"]of if they did really fall into heresy or not the thelogians and historians had no problem with the POSSIBILITY of such a fact. (As Jordanes himslef quoted me: "And the thelogians and chuch-historians had no problem in principal with the idea that they really felt into heresy, notwithstanding if they in fact did or not.). So it is twisting my words and also other´s words if Jordanes suggests we were speaking of the Roman Church as such losing the faith. Nobody - NOBODY, NOT ANYBODY!! - on this blog has suggested such an idea!! We all spoke about the Pope as not speaking ex cathedra. Well, Jordanes, perhaps there is a way to discuss in a good style, I still hope so...:-) - but I am myselfe not willing to discuss in that way. Hope you understand. PKTP seems to be right on the question of validity of consecration with "for all". Well, it is not helpfull to say "de defectibus" is not doctrinal but disciplinary. Because it is implicit/indirect doctrinal if it deals with questions of validity. But, an important argument is that probably the words "for many" do NOT belong to the form. Yes, older authors and authorities (like Thomas etc.) claimed that all the words over the calix belong to the form - but the later theolgians held, that only the words "Hic est enim calix sanguinis mei" constitute the form, so f.e. Heribert Jone. And see also the other arguments of PKTP. Unfortunately it's not clear that's the sense in which Bishop Tissier means it. It is, however, my point and the object of my contributions to the discussion. If you don't wish to interact with my points or are annoyed by my contributions, then of course you are welcome not to participate or to respond to what I say. If you do respond, then you should respond to what I say rather than objecting that the point I'm making isn't the point you wish to make or that you wish I would make. No, I'm not suggesting you're speaking of that. Or at least I've hoped you and others weren't, but some traditionalists do hold the un-Catholic notion that Rome, the Apostolic See, can and indeed already has definitively defected from the tradition of the apostles, while other traditionalists just talk incautiously as if that is what they believe. No one, perhaps, except for me, and maybe a few others. My initial comment in this line of discussion was in response to an anonymous person's reference to the possibility that "Rome could be in error." My response was to point out the ways that "Rome" could and couldn't be in error, recalling the perennial Catholic doctrine that the Holy See has never been and can never be in doctrinal error. It proceeded from there, with one person seeming to argue from an unapproved alleged prophecy that "Rome" can or perhaps might already have lost the faith, with another person claiming that 39 of the popes have been heretics, with Brother Anthony and you and Mr. Perkins showing senses in which "Rome" can be in doctrinal error (yet without defecting from the faith? It's apparently not your position or Mr. Perkins', though I'm not sure about Brother Anthony) . . . and it is at least clear that, whatever sense Bishop Tissier and the initial Anonymous may have meant in their talk of Rome's "errors," it's not the sense I intended, it's not the sense you and Mr. Perkins and Brother Anthony intend, and it's not the sense conveyed by the Catholic doctrine that, as expressed by St. Irenaeus, "It is a matter of necessity that every Church -- that is, the faithful everywhere -- should agree with this Church, on account of its preeminent authority, inasmuch as in her the Apostolic Tradition has been always preserved." re PKTP: It is a contradiction in terms to say that one can commit a "grave sin ... objectively speaking". In the strict sense it might be a contradiction [I am not sure, btw], but if you consider the common usage [so s.l.] it is no contradiction. At least we here in Germany use the phrase "to commit a sin objectivly speaking" to say that it was a sin materialiter. So a "sin only materialiter" or "to sin materialiter, ie objectively" is no contradiction in se/terms but a common expression to state that sb did something that is objectively wrong. In discussions we normaly only speak about the forum externum and not the forum internum so if we speak of "somebody committed a sin" it is to be presumed that we only want to speak about the objective level, so materialiter speaking, because it is not ours to judge the forum internum. So this usage seems to be ok - otherwise you were not at all allowed to utter the sentence "sb. comitted a sin" in such discussions about the forum externum. But, ok, perhaps it is more accurate to speak of "sbd. did sth. that is objectively wrong". Jordanes, are you side-stepping the history of the Arian heresy? Additionally, as I have already said, La Salette was approved by the Church as having nothing against the Faith, hence I am free to believe in it whether or not you wish to close your eyes and ears to it. Meanwhile "Rome" loses the Faith. When will these "talks" begin? How much detail will we know about what went on? I don´t think that Ott - by stressing that the duty of interior assent could be dispended/end - he excludes the exterior dissent. But nevertheless, he expressely speaks of the possibility of an error of this acts of authencitc teaching (in the German original: "... daß die Entscheidung auf einem Irrtum beruht"). And from the context and what he says later on it is clear that he does not mean only "prudential error", but real doctrinal error. That this kind of not infallible teachings can be erroneous does not only mean, that there can be some prudentional error or sth. like that but that such a authentic teaching can just be wrong - wrong i.t.s. of a real, doctrinal error. For example, the bull Unam Sanctam most probably contains a doctrinal error - and therefor is a good example of an authentic non-infallible teaching of the magisterium, so the 3rd class of teaching in your classification --- that holds a real doctrinal error, not only a prudential one. And notwithstanding if there was really such a fact/instance of an error in Church-history, at least the POSSIBILITY of such a real error is not excluded by the asistance of the Holy Ghost to the (authentic) magisterium (according to the sent. communis of the theologians). and made clear that "Rome" is too ambiguos. Read: expressly I said that I mean "the people/Cardinals around the Pope" or the "Pope himselfe". So Rome means persons, not the Roman Church. That's just wrong. All Catholic teachers and theologians hold that the Roman Church cannot defect from the faith. but you supress this and answer as if I would have speaken of "the Roman Church". That´s lack of goodwill and so I stop discussing with you and wasting my time... Should the other posters judge it - they can read it here! I have noted your distinction, but the problem with it is that there is no Roman Church without the Pope and the people and cardinals around the Pope. If the Pope and the Roman Curia and perhaps the general body of lay faithful of whom the Roman Church is composed have lost the Faith, it's pointless to protest that whereas those persons have defected, the Roman Church has not. "Rome" is not some abstract idea wholly independent of the Pope and people of the Roman Church. The reason I omitted your qualification is because I do not see how it establishes that it is proper and accurate to assert "Rome is in doctrinal error" in the sense I have been discussing that assertion. It is just not something Catholics should be claiming. It opens the door wide to a consideration that perhaps more often than not the Roman Church has failed to preserve the Faith taught to her by Sts. Peter and Paul. In short, the 1879 "Secret of La Salette" purportedly written by Melanie Calvat, one of the visionaries, was condemned, and books containing the "Secret" were placed on the Index. Let me add that I think K. Gurries does an excellent job of explaining the Catholic doctrine that (to express the counter-proposition to the proposition condemned by Pope Sixtus IV) the Church of the city of Rome cannot err. That should warn us all of the kind of replies they expect from Bishop Tissier de Mallerais. Honestly, they shouldn't fall each and everytime into that kind of traps. For those of us that are not close to the SSPX but still consider ourselves traditionalists, it's hard to read such stuff, as only Mons. Fellay seems "the moderate". Quite sad, I must say. Jordanes: But then, if Rome means not the infallible teaching of the Church of Rome but the fallible teachings of Romes Bishop and Cardinals - in this sense the roman Church can of course err -- the condemnation of this propsosition does only mean the Roman Church when it speaks infallible through the Pope. As for example Pope Innocent III was well aware of the possibility of the Roman Pontif falling into heresy (cf. In consecr. pont. max., sermo II u. III [PL 217, 656 u 664f], cit. acc. to G. Mura). And I referred to the DThC above. Furhter: it would make no sense if the sentence that the Roman Church can not fall into doctr. error or always will keep the faith were not limited to infallible teachings. Otherwise all the Pope´s teachings would become infallible - at least if he is unanimous with his cardinals. - But that´s absurde, because then the ex-cathedra-speaking would not add anything to it. So therefor "Rome" or the "Roman Church" in its non-infallible teachings (in its Popes and Cardinals) can err -- it is not infalible in all teachings. Perhaps I can discuss this with K. Gurries more exhaustive some time - and more fruitfull. I know my Ott very well (and also other old and newer dogmatics - the older I know better ;-)) - and nowhere I can find Your dicstinction that the non-infallible teachings can only be imprudent but not false (doctrinal erroneous). 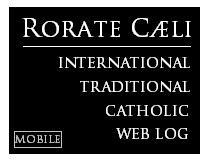 There is no mysterious doctrinal infallibility of "Rome" or the Pope when not speaking ex-cathedra. Well, of course the Pope is also infallible if he teaches definitely together with the bishops on a Council using extraordinary power (mag. extraord.) or unanimous with all bishops throughout the world (mag. ordinarium). So infallible is 1) the mag. ord. or 2) the mag. extraord. of a Council or 3) the Pope alone speaking ex cathedra [mag. extraord. of the Pope alone]. There is no 4th way of infalliblity - and no distinction re this between imprudence and doctrinal error. No, I didn't mean the Church in the City of Rome. The Church universal cannot lose the faith and nor cam the Church at centre, which is inextricably tied to Rome. But the Church is, by definition, the society of believers. So as long as there remain some believers at Rome, the Church can remain at Rome. I suspect that what our Lady meant was that a widespread apostasy could cause most of the believers at Roem, including most in the hiererarcy, to lose the Faith. Our Lady also aaid, on another occasion, that Portugal would not lose the faith. Some now say tha the new abortion law proves the revelation to be false. This is not so. The fact that Portual has, by some way (esp. the wiles of politicians) lost a needful law does not mean that the Portugese people have generally lost the Faith. The real question, I suppose, is whether or not the average Portugese still believes in Christ and His Holy Mother. I mention this because I fear that the average Frenchman, for example, no longer does. There is no dispute that individual popes and cardinals can and do err in matters of doctrine, that not all they say or do ecclesiastically is formally doctrinal or infallible. Nevertheless the condemned proposition remains a condemned proposition, and thus Catholics ought not propose it themselves or try to defend it. Well, I have a lack of will to argue for your points, as you have a lack of will to argue for mine. I still do not see how your points show mine to be in error. As for bossiness, I think that is an inaccurate perception of my participation in this discussion. Don’t be silly. You know that’s not what I said my point is, nor do I believe the false doctrine that Rome is infallible in all of her teachings, and it’s obvious as well that K. Gurries also believes no such nonsense. I wouldn’t hold out much hope for a fruitful discussion there either, not if you interact with him with the same tone you’ve been taking with me. "Where do you get those ideas?" Picard, if you read the article you will see the references (scroll down or click on the footnotes). My post in reponse to Jordanes on the matter of whether or not the 'Jews' and Muslims worship the same God as we was not not posted. I am beccoming closer and closer to the S.S.P.X largely because of this issue. I note that "The Angelus" published the correct position last year, which is that we do not worship the same God as they. This indeed has been discussed on this blog, Jordanes, but there was no outcome in favour of the erroneous view largely advanced these days by bishops. I am hopeful that the S.S.P.X will request a clarifiction on this matter in the doctrinal talks. It needs resolving. To reiterate: the others do not worship the true God falsely; rather, they worship a false god. This is because all the properties of a perfect being are essential qualities, including His Trinitarian Nature. The pre-Christian Jews (and many in apostolic times) did not worship a perfect being Who was specifically non-Trinitarian. As His Trinitarian Nature had not yet been revealed, they simply did not consider the matter, neither affirming nor denying such a Nature. But the Muslims and modern 'Jews' are different: they deliberately and directly *reject* his Trinitarian Nature. They say, in effect, the following: 'We believe in a perfect being who is specifically not a Trinity of persons'. There is no such being. Therefore, they do not worship the God Whom we worship. In the case of the Muslims, their rejection of the Blessed Trinity is very direct: it is intended right in their primary statement of belief. In the case of the modern Jews, the Blessed Trinity is their primary objection to Christianity. In a religion which will not even write the word God (they write G-d in translation), the ultimate perfect sin is for any man to claim divinity. To them, Christianity is the ultimate blasphemy precisely for this reason. A rejection of the Blessed Trinity is at the very centre of the reason they invented a new religion in the early Middle Ages. The S.S.P.X has the correct position on this matter. Most of those in the Conciliar Church apparently do not, and it is an important matter of theology. This is attracting me to the S.S.P.X. I see it as false œcumenism to claim that we all worship the same God. I rather doubt, by the way, that Orthodox Jews and Muslims think that we worship their God, although this is beside my point. There's no reason why both of those propositions can't be true. Yes. And one can also say, "Therefore, when they worship 'God,' the perfect being who made heaven and earth, they are worshipping a being who is in fact a Trinity of Persons despite their erroneous belief that He is not a Trinity of Persons." It would be different if they were polytheistic pagan idolaters, but Jews and Muslims do at least believe in one God, and more so, it is the one God who revealed Himself to Abraham in Whom they profess faith. Acknowledging their imperfect belief in the one God is not a profound theological error, but simple acknowledgement of the fact that in that one very important area the Jews and Muslims share a belief with the Catholic Church. This isn't difficult to understand and needs no clarification from the Holy See. Rather, it strikes one as going out of the way to find something in Vatican II with which to disagree. "To reiterate: the others do not worship the true God falsely; rather, they worship a false god. This is because all the properties of a perfect being are essential qualities, including His Trinitarian Nature." I have believed the same for many years now. God is absolutely three Persons in one Divine Nature. There is absolutely no getting around this fact. To claim to only worship one of His Persons, is impossible. He is inextricably bound to the Triune Godhead. orthodox worship can never seperate Father, Son and Holy Ghost. I could never rightly claim to love my earthly father, in only his material body, without loving my fathers soul as well. This would not be loving him at all. “God, the Creator of all, without whom we cannot do or even think anything that is good, has inspired to your heart this act of kindness. He who enlightens all men coming into this world (John 1.9) has enlightened your mind for this purpose. Almighty God, who desires all men to be saved (1 Timothy 2.4) and none to perish is well pleased to approve in us most of all that besides loving God men love other men, and do not do to others anything they do not want to be done unto themselves (cf. Mt. 7.14). We and you must show in a special way to the other nations an example of this charity, for we believe and confess one God, although in different ways, and praise and worship Him daily as the creator of all ages and the ruler of this world. For as the apostle says: "He is our peace who has made us both one." (Eph. 2.14) Many among the Roman nobility, informed by us of this grace granted to you by God, greatly admire and praise your goodness and virtues... God knows that we love you purely for His honour and that we desire your salvation and glory, both in the present and in the future life. And we pray in our hearts and with our lips that God may lead you to the abode of happiness, to the bosom of the holy patriarch Abraham, after long years of life here on earth.” See, Gregory VII, "Letter to Anzir, King of Mauritania," in Jacques Dupuis, The Christian Faith in the Doctrinal Documents of the Catholic Church, 7th ed., (New York: Alba House, 2001), 418-419. As I said before, re Allah PKTP or others has/have a point -- but also Jordanes and Gurries. I am not convinced by either side. Well, fine, if "nor do I believe the false doctrine that Rome is infallible in all of her teachings, and it’s obvious as well that K. Gurries also believes no such nonsense." is right then what´s the problem?! Not all papal teachings (and of course not all privat opinions or actions!) are infallible, so Rome can fall into error in that sense. But I see a small difference to K. Gurries. I and others hold that this is still "nonsense" and that also a real doctrinal error is possible. That must be discussed, Mr. Gurries. I think it is a good thing at times to emphasise what doctrines of the faith are already believed by non-Catholics, but I also think it is a grave mistake not to delve into the far greater number of doctrines that the non-Catholics do not yet believe. Like St. Paul at the Areopagus, there is a time when the Church ought to stress any area of common ground (no matter how small) with those for whom the Blessed Trinity is an “unknown god,” and then a time when the Church needs to explain and introduce just who God is and how He has revealed Himself to man. St. Paul on Mars’ Hill did both, and we can see that he had a lot less “common ground” to work with in evangelising the polytheistic Athenians than we have in evangelising Jews and Muslims. I had read your site but not so carefully - now I did it again and I see how you quote f.e. Sixtus IV, Vat. I / Bf. Gasser or Card. Journet. i.t.s. that the Roman Church (personified in the Roman Pontifex) cannot fall into doctrinal error if She speaks infallibly. But you CAN not only read them in that sense, but you MUST. a) out of the context. Especially the context of Vat. I makes it clear that besides the doctrinal infallibility of the Pope when speaking ex cathedra (and the two other ways of infallible teaching, mentioned above) they did not want to establish a (I called it "misterious") 4th source of doctrinal infallibility, ie the Roman Church in its authentic magisterium. b) non of the well-known dogmatics/dogmatists (Scheeben, Pohle, Gierens, Diekamp, Jüssen, Ott -- let alone the newer ones!) do teach this. They do not have any limitation re the non-infallible teachings like you make/draw them, f.e. only error of prudence or in some accidential things. No, they clearly state that this teachings can be simply erroneous, wihout any limitation. But well, I have to read the article on your site once again, perhaps I am missing something - then please reference to it. There are ways of emphasising common ground but they must never be made at the expense of the Truth: the end does not justify the means. We can say that every Christian, Muslim and Jews worships only one God, a God Who is perfect in every way. That's fine. We cannot say, however, that those in these three religions worship the *same* God. That would be a lie, and mendacity is a sin. Perhaps Jordanes would say that, in the interest of finding common ground, we could simply omit uttering error rather than proclaim the full truth. That can indeed be justified in some circumstances. But I would guess that getting straight Who God is is rather important. He thinks it so; otherwise, He would not have revealed His Trinitarian Nature until a more 'opportune' time. We now have a problem because NewChurchers are saying blatantly that we worship the same God as the Muslims and the Jews. This is a falsehood which can lead the faithful into serious error. Well, perhaps it is a good thing to ditinguish - as it is normaly a good thing. So I tend to say: "The Muslims" (as such, the Religion) do (does) not adore the one and only God. But a single Moslem can adore him, if he is in invincibly error/bona fide. - So to a single Muslim you can adress that he adores the one and only God - like the quoted letter of the Pope did - but you cannot say this of "the Muslims". Btw, the letter does not go so far as I see - it only states that the (concret) Muslim adores ONE GOD --- but does not say THE one God or THE ONE AND ONLY God. But I am still not sure, perhaps Jordanes/Guerris are still right also re "The Muslims"/the muselmanic religion. "for we believe and confess one God"
Yes, indeed, we do believe and confess that there is but one God, but we do not believe and confess the *same* God! The rest of the words in the passage can be read in terms of the true God indeed enlightening those who do not worship Him but who do, at least, realise that there is but one God. There is but one true religion. As for the others, all their gods are devils. I note that it is possible for non-religious theists (or deists) to believe in the one true God. They can find God by the light of human reason alone, as our catechism affirms. As long as they do not positively deny His Trinitarian Nature, they believe in the One True God. (Some of them neither affirm or dney the Blessed Trinity.) In their case, we say that they misworship the One True God and that their understanding of His Nature is inferior. This would apply to the later Greek philosophers and to some modern non-religious theists. But the Jews and the Muslims are different. Again, they SPECIFICALLY worshiop a non-Trinitarian god. There is no such beast, so they a They say this: We affirm that there is only one perfect being and this perfect being is not a trinity of persons. Hence they are worshipping nothing or else a false god, a devil. "There's no reason why both of those propositions can't be true." Why, of course there is. If the Muslims and Jews do not worship the True God in the first place (and they do not), they cannot worship the True God in any way, either truly (correctly) or falsely (incorrectly or imperfectly). When we say that someone worships the True God falsely, we mean that he does not deny any essential property of God and affirms that there is but one God, Who is a perfect being in every way. It is possible to fail to worship the One True God properly. This can happen if one neither affirms nor denies one of His essential properties (and, being perfect, all his properties are essential: vide St. Thomas on divine contingency). The Muslims and Jews don't just fail to worship Him properly; they don't misworship the One True God. By directly denying one of essential properties, they fail to worship Him at all. They worship a false god who has many things in common with the True God. The last comment of PKTP (06 July, 2009 19:08) has convinced me (well, I am still open to discussion, but my inclination is much stronger...). the quoted letter of the Pope also only says that the Muslim adores one God (like we do) -- but the letter does NOT state that he adores THE one God or the SAME God as we. And yes, the concret Muslim can reach the one and true God -- but the muslim Religion does not have the SAME, the ONE and ONLY God, as we. I'm surprised at the stubbornness and pride of some bloggers here. Picard has clearly won the debate on the matter of Rome falling into error, but some simply won't acknowledge this. If, by Rome, we mean the Holy Catholic Church, then it is obvious that the Church can never be in error. However, prelates in the Church, even popes, can err in their expression of that doctrine. Popes can fall into serious error and even material heresy. The Holy Ghost only prevents them from teaching heresy as infallible truth. If a pope should fall into formal heresy, which might not be impossible, he would lose all offices at that instant and simply cease to be pope. When our Lady says that Rome may lose the Faith, she means it generally. She means that the City of Rome and Catholic countries such as Italy can generally lose the faith. It does not mean that every last person in Rome will lose it. The Church is where her believers are. Picard, I can only urge you to read it over carefully (including the notes). I think we need to hold infallibility and indefectibility together at once. The Church in general and the Holy See (Rome) in particular can't defect in the order of Faith and morals -- at any time -- and not only when defining dogmas of the Faith. How then are we to understand "fallible" doctrines of the third degree? Here I quote extensively from the CDF instruction "Donum Veritatis" that provides the key to the [apparent] contradiction. Doctrines of the third degree are subject to err -- not in Faith or morals, per se (the Church and the Papal Magisterium are indefectibile in this realm) -- but only in the prudential aspects that form an inseparable part of the doctrine. Here we have to distinguish between speculative truth and the employment of practical reason that is not immune to error in each and every particular instance. "Therefore, when they worship 'God,' the perfect being who made heaven and earth, they are worshipping a being who is in fact a Trinity of Persons despite their erroneous belief that He is not a Trinity of Persons." No, wrong. It is not simply a matter of failing to appreciate God's revelation of Himself to us. In their case, they make a denial of the Blessed Trinity into a dogma of their religions; they make it the object of a positive act of the will to deny the Blessed Trinity. The ancient Jews did no such thing. Jordanes yet again fails to understand this distinction. There is a DISTINCTION, Jordanes, between not knowing something perfectly and denying something essential. The Jews of the Old Testament did indeed worship the One True God because they worshipped God as He had revealed Himself to them, and because they did not deny a Trinitarian Nature which had not yet been revealed. In fact, given their extreme zealousness in honouring Him, they would not have dared to affirm OR deny those among His properties which had not been revealed to them. The modern Jews who follow the masoretic scholars are entirely different. They not only fail to affirm a divine property; rather, they directly deny it. Ditto for the Muslims. I go further: these two religious go to great trouble to deny the Blessed Trinity as an article or dogma of their faith. "When our Lady says that Rome may lose the Faith, she means it generally." You are referring to a dubious text that was never approved by Rome. On the contrary, the text containing these words was placed on the Index. And wonderful clear and distinguished/differentiated - good for ending the debate. (if not Gurries has some new arguments to show that non-infallible teachings of the Popes can only be erroneous in matters of prudence but not in a doctrinal sense -- a thesis that I have not found in any dogmatic that I have ever consulted - but please, Mr. Gurries, give me some counter-arguments if there are some that I have overlooked!). we can see that [St. Paul] had a lot less “common ground” to work with in evangelising the polytheistic Athenians than we have in evangelising Jews and Muslims. Jordanes shows a lack of knowledge in a matter of history here, specifically the history of philosophy. The Late Greeks of the Apostolic Age did not have a devout belief in Zeus. Hello, hello! This is not 800 B.C. ; it is A.D. 40. The Greek philophers of later times (or some of them) believed that there was a single perfect being. But they generally held that He 'spun' the universe out of His own being; that the universe and its creator were one. So they would have found wildly illogical our belief that God made the universe out of nothing. How can something proceed from nothing? Of course, we understand that this is an error of materialism: the universe did have an antecedent in God Himself, in His divine will. Being omnipotent, God is able to dissolve any dichotomy between matter and will. The Greeks also had no sense of a personal Saviour and Redeemer, of a personal God. There was no sense of a contract between God and man or a direct communication from God to man. Right living was discerned by an observation of Natural Law, which is God's law. Of course, they were right about the rôle of Natural Law but this is also incomplete, as there is also direct revelation in Scripture. But I disagree with Jordanes's claim that we have more 'common ground' with Jews and Muslims. If he means that this is true in terms of numbers of items of religious beliefs then, yes, it is so. But it is not so in terms of attitudes. The Greeks had a tradition of receptivity to new ideas and were open to the Christian message. In contrast, the Muslims and Jews are adamantly opposed to the Christian message: they even define their faith in terms of a rejection of Christian beliefs. To them, ascription of divinity to a human person is the ULTIMATE blasphemy, and this prevents their evangelisation. Not so with the Greeks. This is something that neo-cons, in particular, seem to have no conception of. They seem to misunderstand completely how violently opposed Judaism and Islam are to Christinaity as a matter of principle. What Jordanes is really all about is this touchy-feely modernistic idea that we must enter a hugathon with our very worst enemies. I refuse. Their only valid choice is to renounce their false religions and convert. It can happen. Many noble Jews have converted over the centuries, for example. I suggest that the neo-conservatives and liberals in the Church have been 'converted' by our news media and by popular opinion. They all want to 'reach out' and hug that Protestant, that Jew, that Muslim or Hindoo (hey, that rhymes!). The idea is dangerously syncretistic and comes from a new religion called Hollywoodism. It and the Ba'hais are near allied. We all really worship the same God. We all have amazingly similar views. We are all groping largely in the dark towards a common light. Some call that light Christ, some the Buddha, some Allah, as pointed at by Muhammad. Brother-love is the general law. Let us love one another and let us all sing stupid sixties tunes about this flower-child love. Where's my guitar? And we've all known so many 'nice' Jews and 'nice' Hindu gents from India and lovely Chinese people who worship their ancestors. If you want to find God, look into a sunset, gaze at a flower, read the Tao te-ching. Read the opening verses of St. John or the Psalms or passages from the Bhagavad Gita. The same God speaketh in every one! Yes, this is a purely human union, not one willed by God. It comes from downstairs. There is no 'Judeo-Christian' set of 'values'; there is no 'Abrahamic set of values'. There is only Christian Faith and a Christian culture. Civilised culture is Christian culture. It is only Christ Who makes us civilised and fit for Heaven. Any hyphenation of that cometh of evil. I think that translation problem ("the same God" instead of "the one God" or "one God") has even appeared in English translations of Vatican II documents. The official Latin text, however, does not have that problem, nor does the English version at the Vatican website, which says, "They adore the one God," not, "They adore the same God." The dogmatic constitution Lumen Gentium, however, briefly mentions :the Mohamedans, who, professing to hold the faith of Abraham, along with us adore the one and merciful God . . ." That, however, does not say and does not mean, "The Mohammadans worship the same God as we," but that, as we adore the one and merciful God, so they adore the one and merciful God. That is, it is an acknowledgement of the undeniable fact that Muslims profess belief in and consciously direct their worship to the one God. Also, as I understand it (I speak as one who knows but a smattering of Latin), while the Latin does not have a definite article, it may still be translated "the one God" rather than simply "one God." Whether or not the definite article actually belongs there I couldn't say. Or as long as they do not knowingly, culpably deny His Trinitarian Nature. I think the problem is in your assertion, which I think is mistaken, that Muslims and Jews cannot be said to worship the true God. In a sense it can be said that their defective worship and faith in the God of Abraham is not worship of the true God, inasmuch as their ideas and understanding of God's nature is wrong, but in another sense it must be affirmed that when someone sincerely offers worship to the God who revealed Himself to Abraham, their worship isn't going to, unbeknownst to them, be redirected and channeled toward Satan. There is, after all, no other God who can receive human adoration but the one true God. Jews and Muslims certainly are not intending to worship the Devil or a demon, and they're plainly not worshipping Nothing. Except, as you have said, for the essential property of the true God's existence. If there is no such God as Judaism and Islam profess, and they're not professing faith in the Devil as God, then the only thing they could be worshipping is the true God, albeitly defectively. Their idea of God is false, and thus can rightly be said to be "a false god," but it is the one true God and no one else they explicitly intend to worship, and thus can rightly be said to be worshippers of the one true God. Nah, I think it's Sixtus IV who won the debate. St. Peter always has the final say. And if by Rome we mean the Roman Church, then it is obvious that the Roman Church can never err (properly understood in the sense explained by the Magisterium). It is not Catholic to assert that She can. Or rather, "if" Our Lady said . . .
Now the Modernist heretics want to widen the franchise to help build up the new false religion of Hollywoodism. The Jews are everywhere well-established in our society (unfortunately) and the Muslims are the largest other religion in terms of adherents. Let us include them! So Christian virtue became 'Judeo-Christian values', and we are now even hearnig of 'Abrahamic values and culture'. How does Judeo-add anyhing? Christians are the true Jews, the inheritors of the promise. Ours is the religion which starts with Genesis, not with the Gospels. It is every bit as much the Old Testaments as the New. By adding Judeo-, we do not add the Old Testament, which was already there in the term 'Christian'. So what do we add? Answer: we add the Talmud, which denounces Christ and our Lady; and we add the massorah. Hence we add error and falsehood, which repudiates Christianity vehemently; we add a contradiction. Let error and truth embrace; let virtue and sin come together and kiss. Now they want to add the unholy and blasphemous Qu'ran as well. And so we have 'Abrahamic values' and the false creed that Christians, Muslims and Jews all worship the same God. They do not. It is a lie. Get ready for further extensions of the franchise in the future. Coming is the new Hollywood Religion of Syncretism, in which all religions are man-made expressions of a desire for the world-soul. Everyone is welcome, especially NewChurch 'Catholics'. Only the followers and sympathisers of Archbishop Lefebvre are excluded. All of this trash comes from the eternal flame of Hell. But dry garbage burns fast. Burn, baby, burn. ""The Mohammadans worship the same God as we," but that, as we adore the one and merciful God, so they adore the one and merciful God. That is, it is an acknowledgement of the undeniable fact that Muslims profess belief in and consciously direct their worship to the one God." No, it merely means that they adore a god whom they profess to be unique in his perfection, and merciful. They profess and direct their worship to ***A*** god who is acknowledged to be one and perfect. So their false god has most things in common with the One True God but they do not worship the One True God. They don't worship Him because they make it an article of their faith that god is specifically not a trinity of persons. They don't merely fail to acknowledge His Trinitarian Nature; no, they directly deny it. That won't do. I have no objection to it, Picard. Sure, Mr. Perkins, albeit it's often the case that one will deny something essential because one does not know something perfectly. I'm quite aware of all that, thanks. Nevertheless most Greeks in Athens weren't monotheist philosophers, and they continued to offer false worship to idols. Starting with their altar to an "unknown god," St. Paul then touched on some of the things the Greek philosophers got right about God, straightway announcing who and what God is and what He has done for man through His Son Jesus. He started with their common ground and then brought in all that the Athenians were lacking. That is the same reason the Church at Vatican II said what She did about the Muhammadans. However, receptivity to new, erroneous religious ideas isn't an element of the Christian message, and the principle of rejecting religious error (or at any rate what one thinks is a religious error) is something that Christianity shares with Judaism and Islam. The reason Jews and Muslims have been so adamant in their rejection of the Christian message is because they've come to the gravely mistaken belief that Christianity is false. If we are to evangelise them, we won't be able to do it without first acknowledging what things they have right. Dwelling only on what they have wrong in a negative polemic as the Church's dominant attitude toward them won't draw very many of them to Christ. Oh come off it, Mr. Perkins. That's what I'm really all about, eh? Ridiculous. The commandment to love our very worst enemies doesn't mean a "touchy-feely hugathon." "it must be affirmed that when someone sincerely offers worship to the God who revealed Himself to Abraham, their worship isn't going to, unbeknownst to them, be redirected and channeled toward Satan. There is, after all, no other God who can receive human adoration but the one true God. Jews and Muslims certainly are not intending to worship the Devil or a demon, and they're plainly not worshipping Nothing." I'm not claiming that Jews and Muslims knowingly or culpably misworship God. Hence I can't know that they'll go to Hell for their errors. However, objectively-speaking, they worship a God Who is specifically non-Trinitarian. Therefore, they do not worship the God of Abraham and of Issac and of Jacob. Their ancestors worshipped the One True God, since they neither affirmed nor denied a revealed property of God. The fact that they are unaware of the truth is immaterial. We ALL have a duty to seek to the truth and to cleave to it with all our heart; and God gives us the means to find the truth if we seek truly: seek and ye shall find; knock, and the door shall be opened unto you. To deny this is heresy, pure and simple. It is a dictum of the Moral Law. Now there may be some who do seek the truth but who have not yet found it; and the degree of culpability of each is not something we can judge. The matter of what their penalty (if any) might be is not the point of issue here. Don't try to wiggle out of the issue! And when you have no reasonable reply, be man enough to admit it! It needn't mean that you are wrong but this is an issue which Rome and the S.S.P.X should address!!! "Also, as I understand it (I speak as one who knows but a smattering of Latin), while the Latin does not have a definite article, it may still be translated "the one God" rather than simply "one God." Whether or not the definite article actually belongs there I couldn't say." In Latin, if one had wished to assert that it means the *same* God, one would need to use idem. Without that, the only sure meaning is 'one God'. By writing, 'the one God' you would be adding something not in the Latin. While the Latin might have intended this meaning, that cannot be assumed. "You are referring to a dubious text that was never approved by Rome. On the contrary, the text containing these words was placed on the Index." So what? The fact that it was never approved by Rome and was once on the Index Librorum Prohibitorum does not mean that it is false. The writings of St. Faustina Kowalska were also on the Index once. Anyway, this is beside the point. The point I made about what is meant by 'Rome' is valid whether our Lady utterered the prophecy or not. brings a very interesting quote and so a serious argument. But I still wonder why no dogmatic has this - if you could quote one that would be clarifiying. I have to re-examine this. "Sure, Mr. Perkins, albeit it's often the case that one will deny something essential because one does not know something perfectly." So as I stated under b) a concrete muslim can infact worship THE one God, so the SAME as we although he expressely rejects Trinity -- -- if he is bona fide, in invincible error & in the state of grace (what might be). But as I said c) the Religion as such, so "The muslims" in common do not worship the one and true God. Here, I think, you are quite right. And therefore the sentence in Vat. II would really be erroneous. but Jordanes claims rightly, that we have more common with Jews and Muslims in some other sense -- and if we have a pagan Greek who really is a polytheist or atheist then the Jew or Muslim is in great advantage: he as a monotheist can be saved if bona fide - the non-monotheist not or most probably not!! So yes, most probably more Jews or muslims will be saved than pagan Greeks. Jordanes and everyone please go to an old prayer book, such as "Blessed be God" or the "Rocata" and read (better yet pray) the Litany to the Sacred Heart Of Jesus - the prayers after the litany are revealing about the notion Catholics are to take about Muslims and Idolators. Jordanes, does the V2 approach work? Who is getting converted, Catholics or Muslims? Back to the fruit Brother - I hope and pray you are now attending the TLM i your area so that you can have an attitude change. Or as long as they do not knowingly, culpably deny His Trinitarian Nature." No, wrong. If they deliberately deny His Trinitarian Nature once it is revealed, they do not worshop the One True God. The question of whether or not their denial is culpable is a separate matter entirely; it a matter not of theological truth but of moral rectitude. They are not *sinning* if their denial is innocent, but it is still a denial of an essential truth: all of God's properties are essential properties (divine contingency). If you directly deny a revealed property of God, you ipso facto deny God Himself. You end up worshipping a false god who shares some properties with the real one. A angel and a demon both discern truth directly but that does not make one the same thing as the other. Here's a parallel. God reveals to us early on that a square is a figure which has four angles and four sides. Later on, He adds that each side must join two others. The Jew is like the man who, after hearing the latter, still insists that a triangle is a square if it has an extra line jutting away from the rest of the figure from one of its angles, for then it still has four angles and four sides. We'd have to say that this may be an innocent error but that the Jew is not apprehending a square but triangle with an extra strut. His ancestors neither affirmed not denied that the four sides each had to meet two others, so they apprehended squares imperfectly but did not assert any error. But the later Jew asserts an error and therefore contradicts the Divine Maker of all figures. Most importantly, he contradicts the Divine Teacher of all things. Fine, but I still think it is proper to distinguish between their worship of God and their gravely erroneous rejection of God's Trinitarian nature. "Objectively-speaking, they worship God, but wrongly claim He is non-Trinitarian." As I've said, I think it is accurate to say that they worship a false god, that they do not worship the one true God, but I can see that in another manner of speaking, they do worship Him while holding false ideas about Him. God is Who He is, independent of a person's perhaps erroneous beliefs about Who He is. What the Vatican II Fathers said on this subject is readily understood, not as a patently absurd claim that Muslims believe God is three coeternal, coessential, and coequal Persons, but as a simple acknowledgement of those few matters of faith where Muslims agree with the Truth. I've seen no evidence, regardless of whatever modernistical types have tried to claim, that Vatican II meant anything other than that. "If there is no such God as Judaism and Islam profess, and they're not professing faith in the Devil as God, then the only thing they could be worshipping is the true God, albeitly defectively"
No, wrong. They do not intend to worship the Satan of the Old Testament, true, but it does not follow that, therefore, they are worshipping the One True God. You cannot assert 'if not x then y' when a, b, and c are sitting around smiling back at you. They are worshipping a divinity of their own creation, made by the masoretic scholars and by Muhammad. This false god of their own creation is a devil, a demon (but not *the* Devil): all the gods of the infidels are devils. Not all the neighbours of Isreal worshipped Satan. Some worshipped Moloch. Your mention of the unknown god in Greek is completely consistent with what I said about the general view of late Greek philosphers. Although there was certainly a widespread debate on God's nature, the idea that He was one with His creation was general. Some of these Greeks did worship the One True God, albeit very imperfectly (e.g. those who only speculated on His nature and His relation to the creation). In contrast, the Jews and Muslims worship a false god who is specifically not a trinity of persons. They made their false god with their minds just as surely as the Philistines made their false gods with their hands. The former constructred a perfect god congruent with the Scriptural one but made him untrinitrian in his very nature. They are the ultimate infidels. So yes, it really seems to be a false proposition that Muslims - generally speaking - adore the "unicum Deum" as said in Nostra Aetate. Or can you read "unicum Deum" as "unum Deum" [then it wouldn´t be wrong]?? "And if by Rome we mean the Roman Church, then it is obvious that the Roman Church can never err (properly understood in the sense explained by the Magisterium). It is not Catholic to assert that She can." Yes, on this we agree. The Catholic Church is universal but is also Roman. There will always be a true Church at Rome and dispersedly: urbs et orbis. Again, though, it is possible that most of the people living at Rome will lose the Faith and that, presumably, is what our Lady meeant. To deny an essential property of an absolute is to deny the absolute itself because all essential properties of an absolute are contingent; they all depend on one another. So if you deny an esential revealted property of God, what you perceive as God will not be God: it will be some other object bearing a resemblance to god. It is as if they worshipped the image of God they saw in a mirror, whereas we worship the One Who cast that image. but it would be wrong to claim it for the muslims generally speaking - because that amounts to their religion as such - and re their religion as such there can be no error mere materialiter, but the error is always formal (because dealing with a system as such, not with personal convictions). Or in other words, there can be no difference between de re and de dicto if dealing with their religious system as such. "So as I stated under b) a concrete muslim can infact worship THE one God, so the SAME as we although he expressely rejects Trinity -- -- if he is bona fide, in invincible error & in the state of grace (what might be)." No, Picard, the Muslim does not worship THE one God. The fact that he may not worship dishonestly is beside the point. Perhaps God will not blame him owing to invincible error. I cannot know in any particular case. But the Muslim is not worshipping the same God as we, the only One True God. The Muslim worships a false deity of his own creation. This false god shares many properties with the real One but is not the same fellow. You know, my younger brother is much like me. He shares the same ancestry and has also inherited my arrogance and high intelligence. He also has good taste in alcohol, like me, and knows how to sail (although he's better at it). But he's not I, thank God! I've prayed that litany and its prayers many times since my conversion, Blatua, and expect to do so again many more times. What do you mean by "the V2 approach"? As long as it's not a change for the worse, Blatua. I wish to give my children the experience of the Church's liturgical treasures, and trust God to help us avoid any "traditionalist" pitfalls. "As I've said, I think it is accurate to say that they worship a false god, that they do not worship the one true God, but I can see that in another manner of speaking, they do worship Him while holding false ideas about Him." Well, it must be one or the other. Even the mighty Jordanes but obey the law of non-contradiction. Now here is how the S.S.P.X can hold the Pope's feet to the fire! Let's have some clarity. Too many silly twits in the We be Church gang are saying that the Muslims worship the very same God we worship. It's bloody nonsense, and it's time that the Church made a distinction between Cardinal Kasper's dreamy bedtime fantasies and the truth. The two have little in common. And, by the way, those who are waiting around for the messias's first appearance do wait in vain. They might as well wait for a pink elephant. So you agree with me. If they're doing it "deliberately," then they are knowingly, culpably denying His Trinitarian Nature. If they're not doing it deliberately, freely, knowingly, then it would be inaccurate to identify their worship of God as worship of a false god or of demons. And we'd also have to stipulate that if, while looking at a square while being afflicted with terrible vision problems, he insists that it is a triangle with an extra strut, he would still be looking at a square no matter what he thought or claimed he was looking at. Well, in the case of Judaism the denial of the Incarnation and Trinity came in the first century, centuries before there were any masoretic scholars, so the Jewish "divinity of their own creation" is a good deal older than your words would suggest. Of course "divinity of their own creation" is another way of referring to their faulty understanding of God, since a divinity of human creation by definition is not a divinity at all, but is a fiction. You still have not established that Jewish and Muslim worship of God is a profession of faith in nothing or faith in demons. You may persist if you wish in your attempt to establish that it is wrong to say Jews and Muslims worship the one God, that one may only say that they worship a false god rather than that theirs is a defective worship of God, but I don't see any way to that goal, nor that it's of much benefit even to try to get there. Instead, I find it more helpful and perhaps a bit more precise to distinguish between their worship and their mistaken beliefs, while granting that it is accurate to speak of their religion as you prefer. "So you agree with me. If they're doing it "deliberately," then they are knowingly, culpably denying His Trinitarian Nature. If they're not doing it deliberately, freely, knowingly, then it would be inaccurate to identify their worship of God as worship of a false god or of demons." No, Jordanes, deliberately does not mean knowing it to be an error. When I say that they deliberately deny the Trinitarian Nature of God, I mean that they know what is meant by a Trinity and deny that God is a Trinity. I do NOT mean that they know that God is a Trinity and yet stubbornly refuse to accept this. The latter alone is sinful. But the former is still erroneous. Get it? "If they're doing it "deliberately," then they are knowingly, culpably denying His Trinitarian Nature." No, non sequitur. The fact that they know what is meant by a Trinity and deny that God is a Trinity does not mean that they are culpable at all. To be culpable--guilty of sin--they must believe or tend to believe that He is a Trinity and yet refuse to accept this. You keep mixing this up. I am not saying that they are sinning for worshipping a false god. They presumably don't know that the god whom they worship is not the real one. What I am saying is that they know what is meant by the concept of a Blessed Trinity and then deliberately deny that this is one of His properties. Stop fudging. Is there any sin involved? I don't know in any particular case. However, we are all bound to seek the truth and cleave to it with our whole hearts and minds; and God gives us the means to find Him. Perhaps some of them are seeking and will find in the future. It is reasonable to suppose, of course, that many of them have hardened their hearts, just as the liturgy of the Church has asserted for centuries. We can make a general statement about it but cannot apply it to particular individuals except where we have evidence in some cases. If one understands "a false god" as referring to "erroneous beliefs about God," then the contradiction is apparent, not real. I will, however, rescind my previous statement that "This isn't difficult to understand and needs no clarification from the Holy See." I don't find it difficult to understand, but that doesn't mean anything. At the very least the matter of translation and interpretation of NA and LG on this point is in need of some clarification, for the sake of Catholics like Mr. Perkins or Mr. Hunter or Prodinoscopus, as well as for the sake of Catholics and non-Catholics who want to gloss over serious theological disagreements and/or promote some kind of syncretism or universalism. "And we'd also have to stipulate that if, while looking at a square while being afflicted with terrible vision problems, he insists that it is a triangle with an extra strut, he would still be looking at a square no matter what he thought or claimed he was looking at." Inverted analogy. In their case, they may have poor eyesight but they also refuse to put on their glasses, These glasses are called the New Testament. The problem, Jordanes, is not that the Jew is looking at a square and, owing to poor eyesight, only sees a triangle with an extra strut. The problem is that he is looking at a triangle with an extra strut directed away from it (one which never joins another side) and he is insisting that this is a square. It is not a square because the fourth strut ends in space: it does not join any of the other sides. I suspect a lot of Catholics today don't know what is meant by a Trinity, and it strikes me as likely that proportionally more Jews do not know what is meant by a Trinity either. That said, you and I apparently mean the same thing by "deliberately deny the Trinitarian Nature of God" -- denying the Trinity while not suffering under culpable ignorance of the Trinity. I would find it more fitting to speak of worship in such circumstances as worship of a false god, though again one would have to explain such language. I'm not talking about whether their actions are subjectively sinful per se, but whether or not they direct their worship to God or rather to someone or something else. Those who really know what is meant by a Trinity, and who know what the Church says about it, but still deny that God is a Trinity, could not be said to be invincibly ignorant. Or so you say. He's not really, or not exclusively, doing that, though. "I suspect a lot of Catholics today don't know what is meant by a Trinity, and it strikes me as likely that proportionally more Jews do not know what is meant by a Trinity either." I guess Jordanes has never been to a film with two friends, or is that only a trio? I am sure that every intelligent Jew and Muslim knows what we mean by a trinity. One of the five pillars of Islam is a denial of it, and that is how they are taught to believe it: There is no God but God and Muhammad is his prophet, &c.
"If one understands "a false god" as referring to "erroneous beliefs about God," then the contradiction is apparent, not real." (b) The Jews and Muslims worship a god of their own creation who is modelled on the true God but is not identical to Him, since their god is specifically non-Trinitarian. I assert (b). I say that they worship the image of God which they see in a mirror, whereas we worship the One Who cast that image. God and His image are not identical, only alike. Now (a) and (b) cannot both be true at the same time: that would entail a contradiction. Agreed? So, I urge the S.S.P.X to clear this matter up in its discussions with Rome. Why do I ask this? It is because NewChurchers and neo-cons are blithely declaring that these infidels worship the One True God, the same God who is Jesus. I say that this is false, that they worship a false non-trinitarian god made with their own minds, just as the Jebusites and Philistines of old worshipped false gods which they made with their own hands. Why resolve the problem? Not for me. I am confident in my belief. It is because the false statements of numerous so-called Catholics is causing confusion, error and doubt. It is leading souls astray. Liberals are trying to use V. II statements to create a new syncretistic religion in which we all worship the same Guy. It mustn't be allowed to stand. Muslims and Jews adhere to poisonous religions which must not be allowed to contaminate Catholic culture or society. We are not all part of one happy family of syncretists. We are Catholic.